On Morgan Avenue in the ancient section of industrial Brooklyn, not far from the legendary heart of darkness which is the English Kills tributary of the Newtown Creek, there may be observed a rail crossing. Part of the so called LIRR Bushwick Branch, recent opportunities have allowed me to fill in a missing piece of the great puzzle. 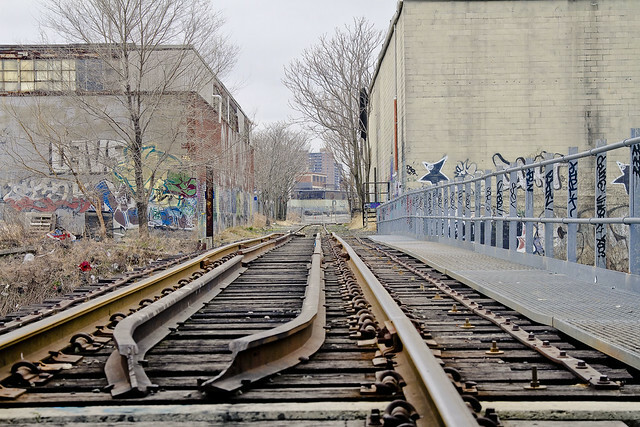 The Bushwick Branch, also called the Bushwick Lead Track, is a freight railroad branch that runs from Bushwick, Brooklyn, to Fresh Pond Junction in Queens, New York, where it connects with the Montauk Branch of the Long Island Rail Road. It is owned by the LIRR but operated under lease by the New York and Atlantic Railway, which took over LIRR freight operations in May 1997. By no means should it be inferred that any special knowledge of the history of street grade rail in Brooklyn is possessed by your humble narrator, as this is still a subject under study around Newtown Pentacle HQ. If you were to look left (or south west) while on Morgan Avenue and traveling northward, this is what you’d see, way back here in the Cripplebush. 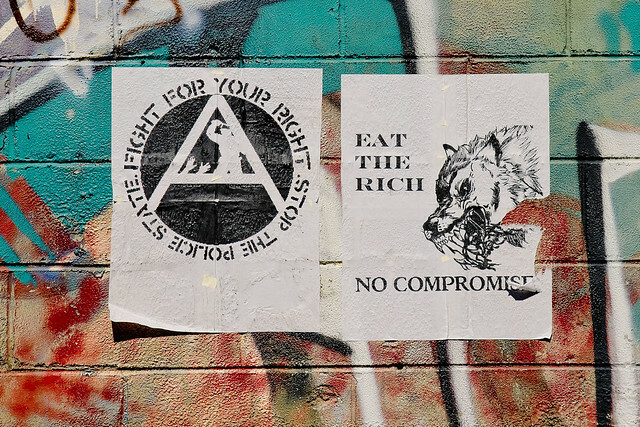 Although the City of New York recognizes East Williamsburg as a neighborhood, there are no official boundaries to East Williamsburg since the City only officially delineates Community Districts and Boroughs, not neighborhoods. Looking right, or north east, you’ll see what appears to be a locomotive right of way that terminates at a distant green wall. The Bushwick line has been explored by many others who are braver of heart than I, including Diego Cupolo and Forgotten-NY’s own Kevin Walsh. There’s a missing piece in their accounts (which to be fair, has been off limits to inspection by passerby for some time), however, which recent serendipity allows me to bring to you. 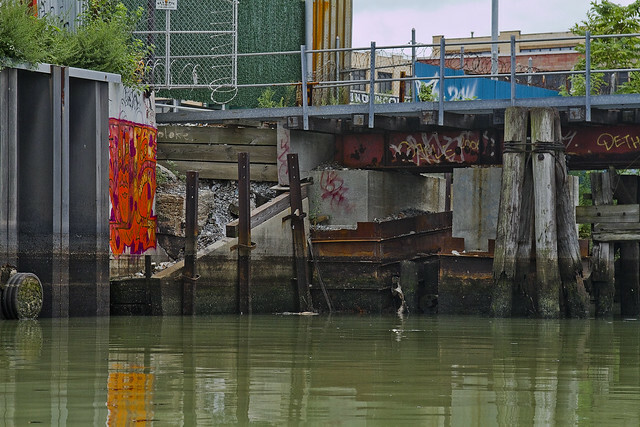 This is, after all, part of Newtown Creek. In the olden times the lands on both sides of Newtown Creek were most intimately connected. County lines were unknown, the creeks were dividing lines between the several plantations, for the reason that lands near a creek were taken up in preference to others, and the creeks were used in place of roads to transport the produce of the farms to the river, and thus it was made possible to reach the fort on Manhattan Island. The territory along the Newtown Creek, as far as “Old Calvary Cemetery” and along the East River to a point about where the river is now crossed by the Queensboro bridge and following the line of the bridge past the plaza, was known as Dutch Kills. On the other side of Old Calvary was a settlement of men from New England and, therefore, named English Kills. The Dutch Kills and the English Kills, as well as the rest of the out-plantations along the East River, were settlements politically independent of each other and subject only to the Director-General and Council at Manhattan Island, but became some time later parts of the town of Newtown. An obsession of mine, let’s just name it a calling, is to photograph every possible corner of the Newtown Creek watershed. Challenging, most of the shoreline is under lock and key, and many parts of it are under strict supervision by security personnel and police authorities. The spot these shots were gathered from is even hazy ground, and although I never stepped on the tracks and stayed to the extreme sides of the pathway, I was probably violating a “no trespassing” rule which I wear on my sleeve. The presence of graffiti and a largish homeless camp I know to exist back here made me feel that any rule against taking a look around is lightly enforced by the gendarme and the proverbial dice would be thrown. Speaking of dice, a locally famous accident occurred on the Bushwick line back in 2004. 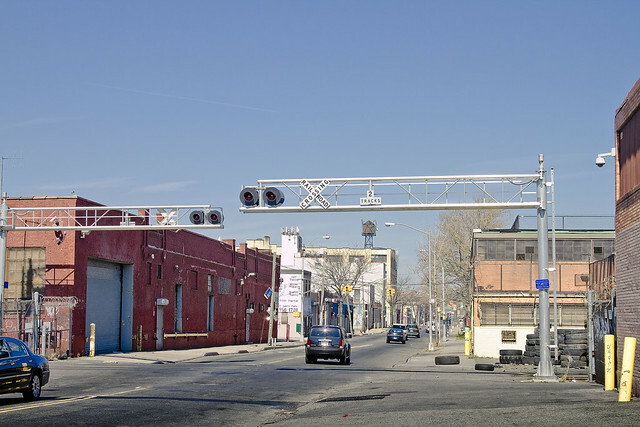 LIRR 160 traveled about 1.2 miles on the Bushwick Branch, passing over seven passive highway/railroad grade crossings. The event recorder indicated that the locomotive traveled the total distance of about 11,692 feet (2.2 miles) in 16 minutes 9 seconds and reached a maximum speed of about 31 mph. During the runaway, LIRR 160 struck an automobile at one grade crossing and pushed it several hundred feet. The two occupants of this vehicle sustained serious injuries and required hospitalization. At another grade crossing, the locomotive struck two more automobiles, resulting in serious injuries to their drivers, who also required hospitalization. Two trucks were parked along the tracks near another grade crossing. The locomotive struck the trucks and pushed them about 800 feet westward beyond the crossing before it stopped. One of the trucks was carrying welding supplies, including acetylene and oxygen cylinders; the cylinders were damaged during the accident and caused a fire. The trucks were unoccupied; however, employees of the trucks’ owner had to jump away from the track to avoid injury. As LIRR 160 collided with the automobiles and trucks, the struck vehicles were propelled in different directions and struck other vehicles. As a result, the accident damaged five other vehicles and a backhoe. Speaking of graffiti, these puzzling bits of signage were observed on a well painted wall. Like the “God’s Gift to Pain” graffiti at the end of English Kills, however, they filled me with some nameless dread. 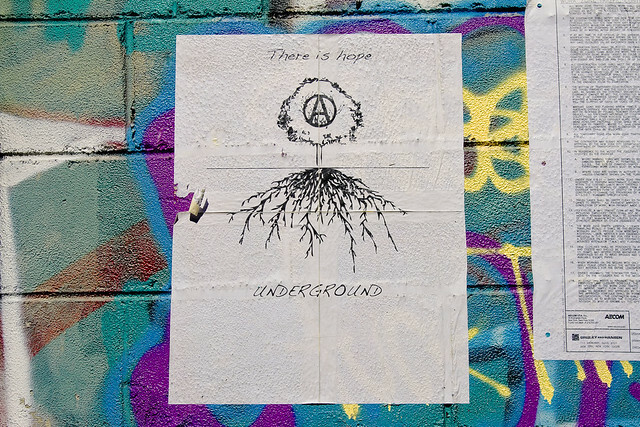 The first recorded use of the A in a circle by anarchists was by the Federal Council of Spain of the International Workers Association. This was set up by Giuseppe Fanelli in 1868. It predates its adoption by anarchists as it was used as a symbol by others. According to George Woodcock, this symbol was not used by classical anarchists. In a series of photos of the Spanish Civil War taken by Gerda Taro a small A in a circle is visibly chalked on the helmet of a militiaman. There is no notation of the affiliation of the militiaman, but one can presume he is an Anarchist. The first documented use was by a small French group, Jeunesse Libertaire (“Libertarian Youth”) in 1964. Circolo Sacco e Vanzetti, youth group from Milan, adopted it and in 1968 it became popular throughout Italy. From there it spread rapidly around the world. The icon in the tree part of this illustration is meant to be an “anarchy” symbol, but to me it looked like some multi lobed eye, if you know what I mean. Weird things go on around here, and this is no safe place, even while the radiant attentions of the burning thermonuclear eye of god itself are shining down upon the poison shores of English Kills. 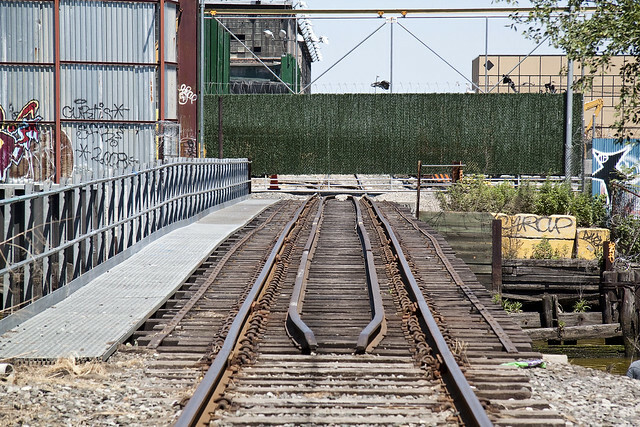 Speaking of English Kills, this is the rail bridge which the tracks of the Bushwick Branch utilize to cross over it. In the background of the shot is one of the largest CSO outfalls in New York City and behind that is an access a ride parking depot and Johnson Avenue. This is what it looks like from the water, incidentally, and long have I desired to see the New York and Atlantic crossing it from this perspective. The bridge, which I’ve always heard referred to as “The Montrose Avenue Rail Bridge” is found some 3.8 miles from the East River, and regains land on the eastern shore of English Kills. Notice the green gate visible in the shot above. James Riker’s 1706 “Bushwicklands” were separated from the original het dorp site by the estuary wetlands that would evolve from a creek into fetid industrial transportation canals (from the Dutch kil, trans. “body of water”). As the old farms were surveyed and sold as city-block lots, area borderlands became an underbelly serving the 19th century constructions of the “English Kills Canals,” the “Town of Bushwick” to the south, and the westerly “Village of Williamsburgh.” Becoming an offal zone for breweries, slaughterhouses, & chemical manufacturing, glass, rope & bag factories, and coal, oil, & stone distribution: the flatland meadows and canal basins provided business opportunities for waves of 19th century Central European immigrants that was near, but away from, metropolitan domestic life down Bushwick Ave. Here is that same gate, from the perspective of the trackway. The property behind that gate is the Waste Management Varick Avenue site, which is pretty much off limits. The fabled garbage train begins its journey to the continent here, as the Varick Avenue facility handles much of the putrescent waste produced in Brooklyn. Waste Management, Inc. (NYSE: WM) is a waste management, comprehensive waste, and environmental services company in North America. The company is headquartered in Suite 4000 at the First City Tower in Downtown Houston, Texas, in the United States. The company’s network includes 367 collection operations, 355 transfer stations, 273 active landfill disposal sites, 16 waste-to-energy plants, 134 recycling plants, 111 beneficial-use landfill gas projects and 6 independent power production plants. Waste Management offers environmental services to nearly 20 million residential, industrial, municipal and commercial customers in the United States, Canada, and Puerto Rico. With 21,000 collection and transfer vehicles, the company has the largest trucking fleet in the waste industry. Together with its competitor Republic Services, Inc, the two handle more than half of all garbage collection in the United States. Speaking of Waste Management, the serendipity mentioned above involved your humble narrator joining with a group of students on a tour of the facility, and this is what the rail bridge looks like from the other side of the gate. Welcome to the unknown country. 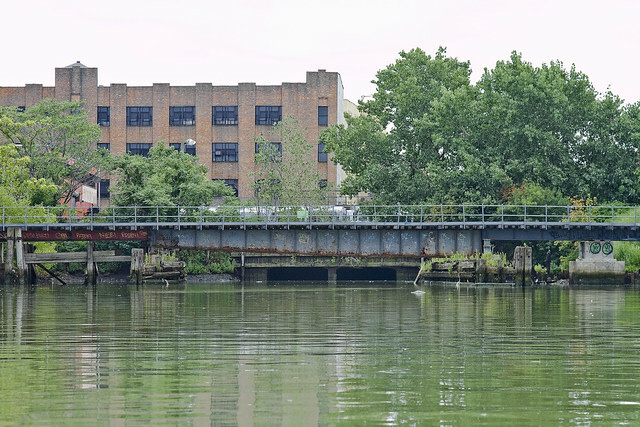 Waste Management has a substantial waste transfer operation located on English Kills upstream from the Metropolitan Avenue Bridge, incorporating all of the east side of the English Kills from Ten Eyck Street to the LIRR bridge near the head of the creek, an area of 24.7 acres. Currently, Waste Management uses the site to transfer commercial and residential refuse to trucks and rail for transport to landfills in New Jersey, as well as to store and maintain their trucks. Another posting coming in the near future will discuss the interior workings of this place, but for now, here’s where the Bushwick branch tracks continue on their course. This is where the folks at Waste Management containerize and load up the “garbage train”. For decades, as trash has made its way from transfer stations in Brooklyn to out-of-state landfills, it has been shuttled through the borough’s streets on ground-rattling, smoke-belching tractor trailers. The result: irritated neighbors and polluted air. On Wednesday, Mayor Michael R. Bloomberg unveiled a plan to replace those trucks with trains. 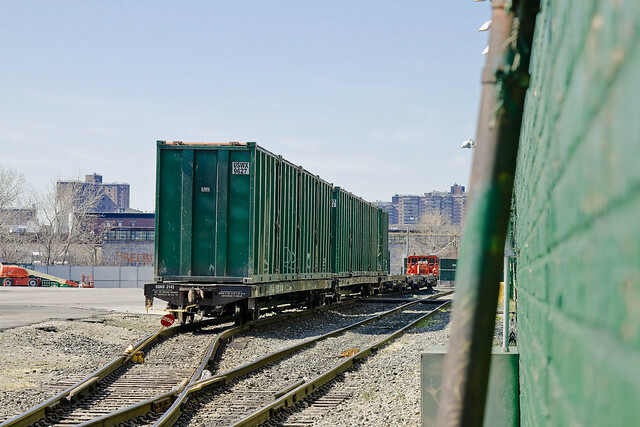 The city will now transport tons of garbage out of Brooklyn via railroad, which will take thousands of trucks off the street. Speaking at a trash transfer station in North Brooklyn — with a trash-filled train behind him — Mr. Bloomberg said that the change would eliminate about 13,000 truck trips a year, helping the city meet ambitious goals for cutting carbon emissions. 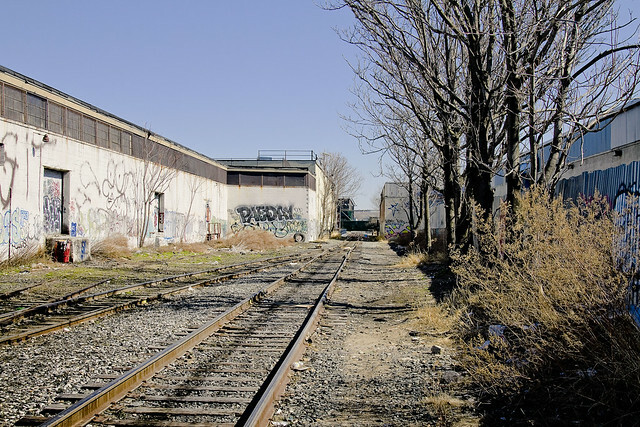 The tracks continue northeast across the property, and towards Varick Avenue. 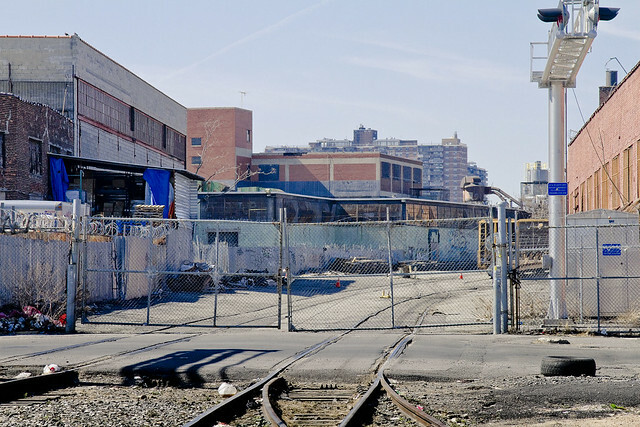 They cross Varick at Grade, and continue on their winding course toward the Fresh Pond depot, crossing Flushing Avenue in Maspeth and meeting connections toward Long Island City not far from Rust Street. 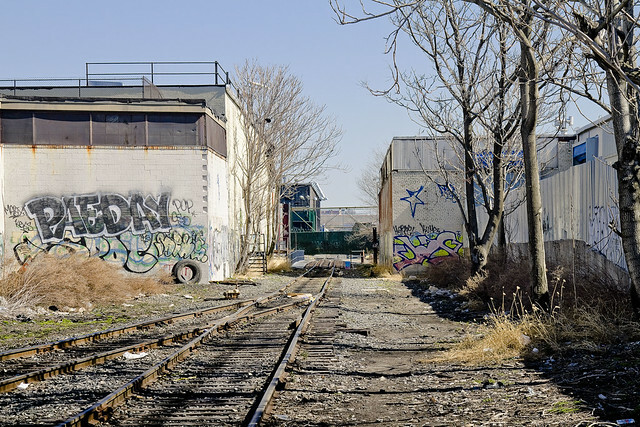 This Rust Street connection offers access to the tracks which follow Newtown Creek through West Maspeth, Berlin, Blissville, and terminate ultimately at Hunters Point. Once, they carried cargo all the way to the East River, where Gantry Docks loaded them onto float barges for delivery in Manhattan and beyond. 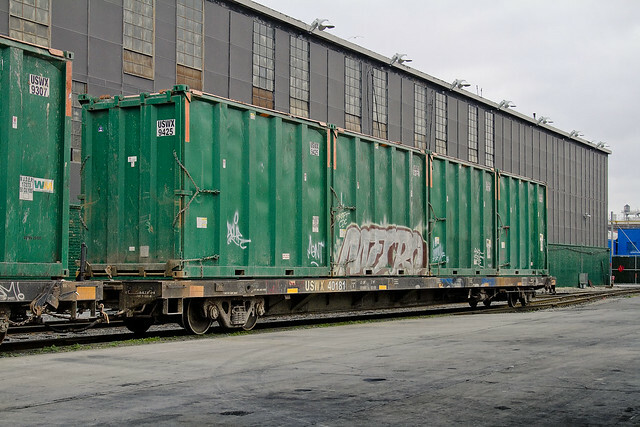 While many people balk at taking out the trash, it’s a job that the New York & Atlantic Railway does gladly — hauling 1.7 million pounds of residential and municipal waste each day, destined to Dixie in sealed containers riding aboard extra-long flat cars. 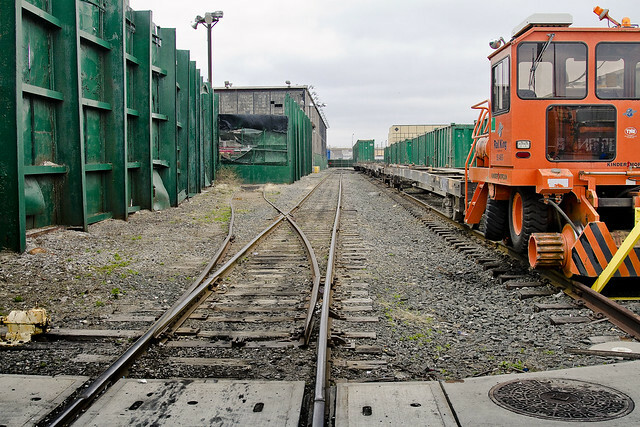 Monday through Saturday, a NY&A train crew goes over to the Varick Avenue transfer station in East Williamsburg, Brooklyn, where they couple up with 10-to-12 89-ft. flat cars loaded with up to 48 22-ft. long containers. Each has been stuffed with 18 tons of refuse, collected from homes and businesses in North Brooklyn. 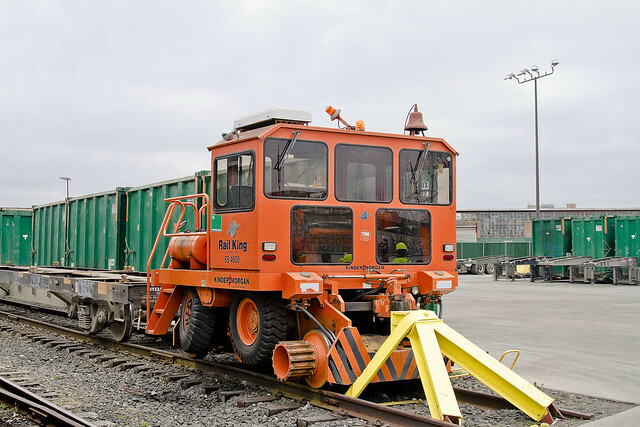 The Varick Avenue facility was redesigned recently to accommodate rail shipments. It is owned and operated by Waste Management Inc. — one of the nation’s leading transporters and processors of municipal waste. NY&A began test movements in late January and handled its first regular shipment on February 16, 2009. And this is the reversed POV, shot through a gap in the fence on the sidewalk. The line continues on the other side of Varick, in the distance, you can see the Scott Avenue Footbridge. 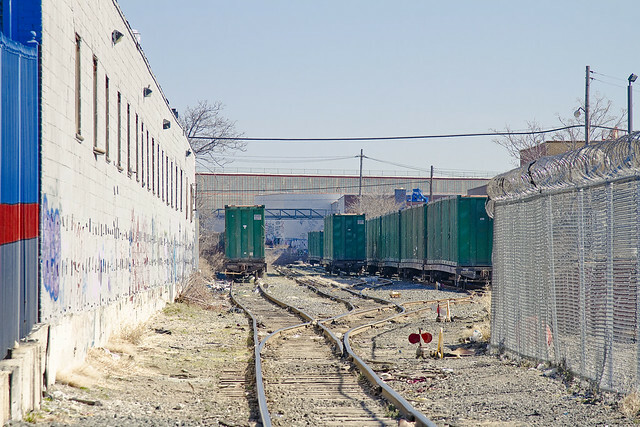 This “trainsarefun.com” page offers detailed schematics and historic shots of the Bushwick line, which are certainly worth a moment of your time.